Categories: Adoption Parenting, Adoption Professional Basics, Multicultural Families, The Adoption Professional, Transracial Adoption, About Adoption, Making the Decision. Can White parents teach their Black children African American culture and history? Can they impart to them the survival skills necessary to survive in the racially stratified United States? Concerns over racial identity have been at the center of controversies over transracial adoption since the 1970s, as questions continually arise about whether White parents are capable of instilling a positive sense of African American identity in their Black children. “[An] empathetic study of meanings of cross-racial adoption to adoptees” Law and Politics Book Review, Vol. 11, No. 11, Nov. 2001 Through in-depth interviews with adult transracial adoptees, as well as with social workers in adoption agencies, Sandra Patton, herself an adoptee, explores the social construction of race, identity, gender, and family and the ways in which these interact with public policy about adoption. Patton offers a compelling overview of the issues at stake in transracial adoption. She discusses recent changes in adoption and social welfare policy which prohibit consideration of race in the placement of children, as well as public policy definitions of “bad mothers” which can foster coerced aspects of adoption, to show how the lives of transracial adoptees have been shaped by the policies of the U.S. child welfare system. 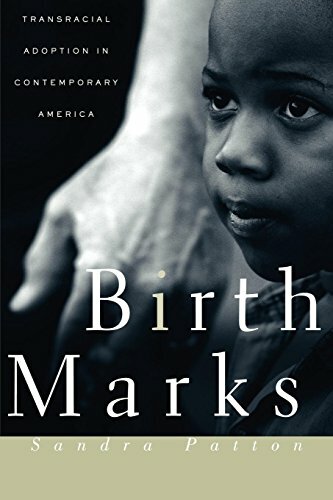 Neither an argument for nor against the practice of transracial adoption, BirthMarks seeks to counter the dominant public view of this practice as a panacea to the so-called “epidemic” of illegitimacy and the misfortune of infertility among the middle class with a more nuanced view that gives voice to those directly involved, shedding light on the ways in which Black and multiracial adoptees articulate their own identity experiences.